Experience the “Pearl of Africa”, as Uganda was dubbed by Winston Churchill, on our Uganda Discovery Safari. This mostly wing journey highlights some of the best wildlife experiences possible in the country. Boat trips on the Nile below Murchison Falls and on the Kazinga Channel in Queen Elizabeth National Park expose concentrations of waterside wildlife and waters filled crocodiles and hippos. Morning and evening game drives offer sightings of lion, leopard, buffalo, giraffe, hartebeest, Uganda kob, waterbuck, elephant and 450 bird species. Begin your overnight journey to Uganda as you embark on our Uganda Discovery Safari! You are welcomed on arrival in Entebbe and escorted to your waiting transfer vehicle for the short drive to your lodging. Wing north to Murchison Falls National Park, origin of the Nile. Gamedrives and a river excursion offer possible sightings of elephant, buffalo, giraffe, Jackson’s hartebeest and oribi. With luck, lion and perhaps even a leopard may be sighted. The diverse landscape is habitat for over 76 mammal and 450 bird species. Fly to Queen Elizabeth National Park for two days of wildlife viewing. The Park is over 763 square miles, offering a variety of habitats for over 95 mammal including elephant, Cape buffalo, lion, leopard, waterbuck, bushbuck, Uganda kob, warthog, hyena, topi and sitatunga. Many of the 612 bird species are regarded as “specials” within East Africa, which makes the park a must see for birding enthusiasts. Take a boat trip on the Kazinga Channel. Crocodiles and hippos lurk beneath the water and bask on the banks, where buffalo, elephants and other residents of the grassland thickets come to drink. Drive to Bwindi Impenetrable Forest. This rain forest is ancient, dating back over 25,000 years. It is comprised of dense, tangled vegetation on a mountainous landscape of deep valleys and steep ridges, which requires a reasonable level of fitness. Your guides will lead you through the undergrowth, parting thick creepers, to track the gorillas. 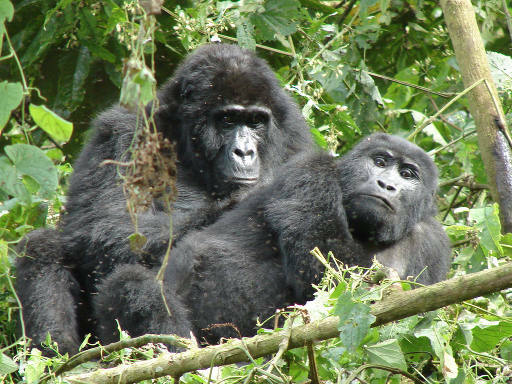 You are allowed exactly one hour with the gorillas before returning to the base station. Fly back to Entebbe this morning. Visit Ngamba Island Chimp Sanctuary. Attend the afternoon feeding before transferring to the airport in time for your departing international flight. Arrive home with treasured memories from your time on our Uganda Discovery Safari. My favorite activity at Queen Elizabeth was the boat ride on the Kazinga Channel. It’s said to contain the world’s largest concentration of hippo, and you can watch thousands of them practically piled on top of each other in the shallows. This is where to get that photo of a hippo yawning.